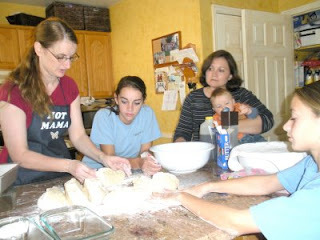 Last Saturday, my wonderful sister-in-law, Wendi, invited several of us family members over to learn to make bread. We ground the wheat with a hand grinder (several of the guys helped), and kneaded the dough by hand too. It was great for my girls because I wanted them to experience all of this from a great teacher. Maybe some of you can do this with your nieces, daughters, sisters, and sister-in-laws as well! 1. Melt the butter and then just add the other ingredients including the instant yeast in a large bowl. I just stir all these ingredients together until they are somewhat dissolved. 2. Add 10 c. flour (I used 4-5 C of the fresh ground white wheat and the balance regular flour) stir to moisten flour. 3. Dump 4 more cups flour onto the counter; dump the dough on top of it, and knead. You know you have kneaded it long enough when all of the flour is mixed in. 4. Return to large plastic bowl. Cover with a dishtowel. Let rise until double. 5. Punch down to get all of the air out. 6. Roll into loaves and put in 6 greased regular loaf pans. 7. Cover with dishcloth again and let rise until double. (Hint-I usually have better luck if it’s not rising on granite. I put a dishtowel under it for added warmth). 8. Preheat oven to 400 degrees. Bake for 25-30 minutes. Take out and dump onto a dishtowel until cool. You have no idea how thankful I am to have all of this information!! Huge sigh of relief! That's great about making bread. Especially so for your girls. 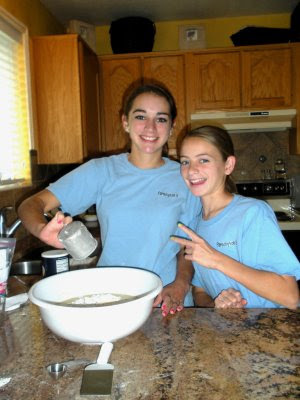 My girls have been making bread for years. When you have such large families it's the thing to do is assign them their jurisdictions. Now my older girls all thank me for the things they were responsible for. 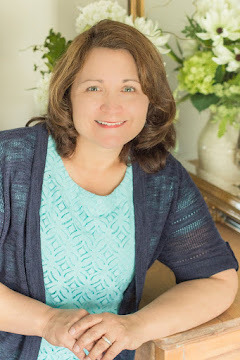 There was always one who had to grind the wheat, one to do the baking, and one to do meals. The 4 of them would trade off between the kitchen duties and laundry. Great experience for them. Now our younger 5 girls are beginning to take the helm. This is a great site! I have a couple of questions: How many sticks of butter equal one cube? Also, if we were without electricity and had to bake our bread over, lets say, a fire-pit what would you suggest the procedure be for this. Possibly a Dutch Oven could be used? How long do you think this would need to bake over a fire such as this? 1 cube is 1/2 cup butter. Chech online for Dutch oven bread making recipes.